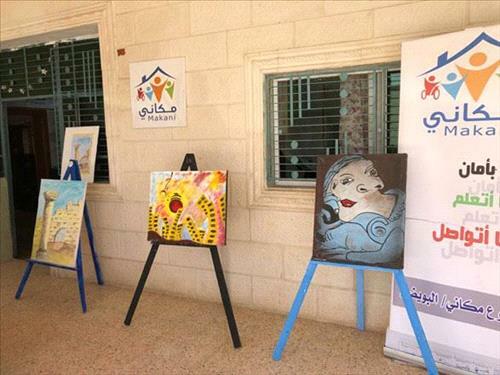 AMMONNEWS - Upon entering the local Makani Centre in Mafraq, visitors get startled by the colourful and eclectic paintings displayed at the entrance, which seem to be the productions of talented renowned artists. Yet, to their surprise, it appears to be the remarkable work of a 16-year-old, Ala, who painted these canvases using nothing but her feet. The teenage girl was born without arms and strived to live her life defying the odds of society. When she was in grade two, she drew a flower while attending the Makani Centre, and caught the eye of its founder, Ahmed Shatnawi. “I started to teach her how to paint and I was really amazed to see how talented she was. She has an artistic ability that goes beyond people without disability,” he told The Jordan Times at the Mafraq centre, noting that Ala was among the lucky young people who got to meet Prince Charles of Wales during his recent visit to the Kingdom. “He sat with her and looked at her painting in the Roman city of Jerash, during a visit with HRH Crown Prince Hussein. It was an incredible and very proud moment,” he recounted, showing the pictures of the encounter with pride. The young artist is one of the 15 children with a disability attending the Mafraq Makani Centre, which is supported by UNICEF and UKAid. The centre, which includes some 17 teachers working with around 250 children, offers educational, life skills and child protection services, according to Naji Hassan, a life skill facilitator at the centre. “Through a variety of activities, whether physical, cognitive, artistic or else, we seek to build these kids’ self confidence and focus, while giving them an opportunity to enjoy an entertaining environment,” he told The Jordan Times, noting that many of these children either dropped out of school or were unable to receive formal education due to their disability. “We have a student, Diaa, 14, who suffers from epilepsy among other physical issues. His father didn’t have enough money to send him to school as he didn’t have a car and could not afford his son’s transportation fees,” recalled Nuha Mayas, a data entry officer at the centre, adding “whenever he would be able to go to school, the teachers would not have the time or ability to give him the special attention he needed, because the classrooms would be so overcrowded”. The young student fled Syria with his family when he was only in fifth grade and stopped going to school when he reached Jordan, scared of interacting with his peers due to his disability. “After our outreach team convinced Diaa’s dad to bring him to the centre, he started receiving informal education and trainings, which greatly boosted his self esteem and confidence in himself,” Mayas remembered, adding “his epilepsy crises diminished and he became much more confident”. Through a range of activities, the specialised staff members help develop the social and practical skills of attending children, whom they encourage to develop their personal talents. “Each child comes to the centre with specific abilities and talents. Instead of forcing anything upon them, we instead support them to develop their ideas and strive in their field of interest,” explained Mohammad Mayas, director of the centre which was established in close collaboration with a local organisation. The UNICEF Makani Centres (“My Space” in Arabic) are a comprehensive initiative offering well-coordinated and multi-sectoral services to vulnerable children between five and 18 years old, according to the UNICEF website. By creating safe social spaces for children to connect, learn, and play, the Makani approach aims to expand learning opportunities for all children unable to access formal education in Jordan, through the provision of life skills training and psychosocial support services. Designed to strongly emphasise the community-based approach, the Makani centres support the engagement of local networks of partners to facilitate best practices and sustainable change. In addition to community outreach components in each centres, many also include former participants from the Makani programmes who became educators themselves. Ahmed, 24, attended the Mafraq centre a few years ago, as he felt hindered by his disability in the regular education system. “The life skills training and the other sessions I attended here really helped me and I always wanted to come back,” he told The Jordan Times, voicing his happiness of now being able to help other children facing similar challenges.